We here at Ventanas Mexico love showing you different home styles in Mexico. Whether it is a house in the city, a condo on the beach, a home in gated community or something in between, each has its own character and will shape how you experience life in this country. We have all seen the movies where the handsome, yet haunted hero lives in a trailer on the beach. If you think he had it good, wait until you see these. My understanding is that the lots in this particular mobile home community on the beach cost about $3,500. After that, as of this writing, you can add to them as you wish, a marked departure from many such communities. in the U.S.
Folks here have added, as you’ll see here, all the amenities. Most have outdoor kitchens and living areas, sound systems and some type of car port. Residents might invest up to $50,000 into their spaces, fully confident they will be able to sell it for same. Fifty-thousand dollars goes a long way in Mexico and might include marble tables and wet bars. As the beach is below a cliff in front of this particular community, a pool has been added, along with a putting green. A separate tiki hut provides a kitchen and space for a band and parties of probably 100 dancing expats and Mexicans... as well they should. A resident might leave the mobile home and an extra car behind when heading back north or jump in their mobile home and drive away, towing a little car they use for their life at the beach in Mexico behind them. One woman in her 60's from Canada makes the trip every year back and forth on her own, proving conclusively that a single woman in Mexico can enjoy the same freedom in choosing her lifestyle as anyone else. Here is the view from the mobile homes. In the final video below, you have the quiz questions. Which movies featured handsome heroes living in mobile homes on beaches? Next up: Are you a Baby Boomer who got trashed in the Recession and still trying to operate by your pre-Recession rules? The music and changed and so should your dancing style. Most recent: What will your food bill actually be in Mexico? 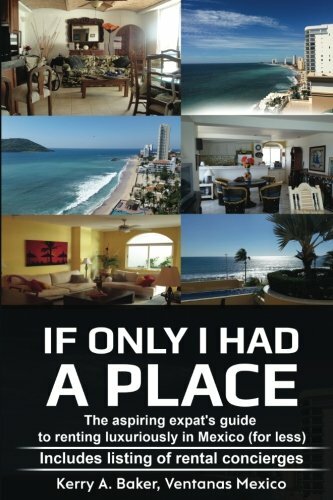 My name is Kerry Baker and I am a partner with Ventanas Mexico which provides insight and resources to those considering expat life in Mexico, including a rental guide, "If Only I Had a Place" (alas, no mobile homes in there). I also wrote my first love, the "Interactive Guide to Learning Spanish Free Online," a curation of the best Spanish language tools on the web. Don't get caught in the web of online search for the best free tools. Find them here with direct links to free features and lesson plans for every level. Enjoy a different learning experience every day!